Our experience in Malacca had been a very different one from the more frantic pace of KL; we'd been able to cover most of the main must-see sites (if not all of them) that Malacca had to offer in just a day. Just as well, then, 'cos that's all we had time for. Today we had to make tracks once more - for Singapore. We got to the bus station at just before 10am. We had been told that the express buses to Singapore ran every hour, and that we would only be able to get a ticket by turning up (no phoning ahead to reserve a seat) but it wouldn't be a problem getting a seat at this time of year. It was just a Tuesday morning, and no religious festival or national holiday in sight. The truth was somewhat different. The buses were not running hourly, the 10am bus was full and the next available slot was at 2pm. Great. We would have to wait 4 hours at a bus station that is miles outside of town - not even the chance of doing any sight-seeing nearby and, besides, we had all our baggage with us. We decided to ride it out in a local café, ordering some chicken rice (again), and then keeping ourselves topped up with regular coffees and soft drinks and today's copy of The Straits Times . The time passed quite painlessly and we got on the 2pm bus without any further hitches. Leaving in the afternoon would necessarily change our plans for Singapore. We had hoped that by setting off from Malacca in the morning, we could get to to a hotel in Singapore early afternoon, check in and leave our bags and squeeze in at least half a day's worth of sight-seeing. As it transpired, we arrived at 6:30 and I had my usual first-day-in-the-country issues to attend to (find an ATM, get some local currency, buy a phone card, call the hotel to check if there's a spare room, rustle up a taxi to get us there). In the end, it was nearly 8pm by the time we'd got settled. Still, it was going to be our only night in Singapore, so we headed out as soon as we could, checking out the nearby areas of Chinatown. We spent a few hours trawling around the market stalls on Pagoda Street, having the latest evening meal we can remember in a long time (a clue that we were dining late was the lights being switched off around us!) and taking a handful of photos of some of the more interesting local architecture. 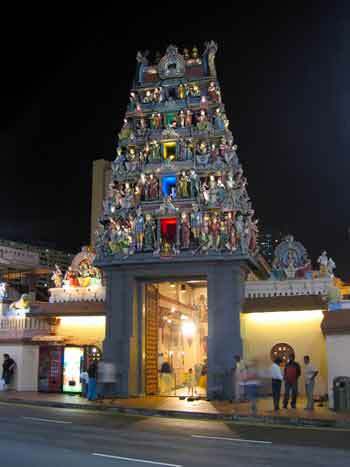 An Indian Temple on South Bridge Road, Chinatown. So, tonight was a landmark on the trip - at about the time we were drifting off to sleep, it was 1 year (given time difference) since we boarded the flight from London to San Francisco. 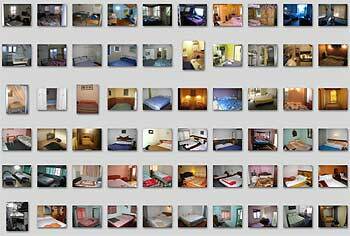 This would be the last hotel/hostel room we'd stay in on this trip. In fact, it would be the 60th place we'd stay in for at least a day, not including our van, Ethel, that took us around Australia. After today, everything would seem routine.